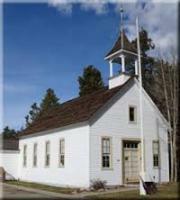 Experience school days past in the authentically furnished 1883 schoolhouse. View the movie presentation of "The Town at the Bottom of the Lake." Tour the Lula Meyers 1885 ranch house and the "Honeymoon Cabin" on the site. The Museum is open from Memorial Day weekend thru Labor Day weekend, Tuesday thru Saturday from 1:00 to 4:00pm. Free, donations welcome. Located at 403 La Bonte St. in Dillon, CO.